Sebago Brewing Company has had a Portland brewpub for more than 13 years. For over a decade the pub was located on Middle Street and then moved three years ago to the corner of Fore Street and Franklin Arterial – below the Hampton Inn. The move was somewhat of a blessing and a curse. 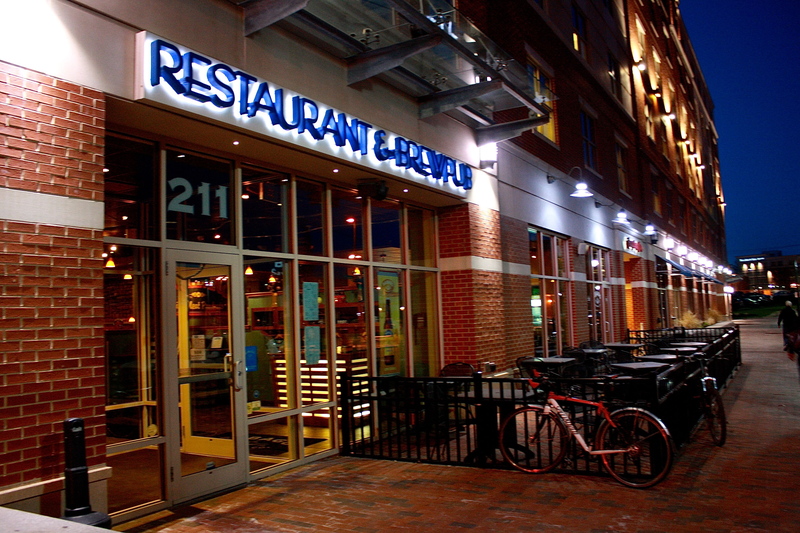 While it has retained many regulars, the Portland brewpub – unlike its other locations in Scarborough, Gorham and Kennebunk – is often confused as either the affiliated restaurant of the Hampton Inn or a national corporate chain. St. Hilaire has been with the company for five years, starting first as dining room manager, and says that the Portland brewpub hired an interior designer to help the space feel more like a local eatery and more casual. The walls were painted and new art was put up. While the false hotel affiliation might not go away anytime soon (but who cares? The hotel is good for business), Sebago Portland has made a point to use more local vendors for its food menu, and as of six months ago, it added a number of other craft brews to its beer list, namely Maine Beer Co. and Founders (Michigan). According to St. Hilaire, one of the Portland location’s advantages over other smaller, locally owned eateries, is its ability to host larger groups – up to 40 or 50. You can bet there will be at least one bachelorette or bachelor party a week, especially during the summer, and each weeknight seems to be designated for a particular meet-up group. For instance, the German club meets on Tuesdays, the Spanish club on Wednesdays, and recently, a small group of folks readying for the annual Burning Man festival in Nevada began meeting on Thursday nights. They sit by the fireplace. While the Portland brewpub has felt the need to make decor changes to appeal to a more hip city crowd, there is something all of the Sebago locations do undeniably well – beer and specials. There will always be eight Sebago beers on tap, plus one in the cask cooler. And they will always offer their four staple beers (Saddleback Ale, Lake Trout Stout, Runabout Red Ale, Frye’s Leap IPA), one or two seasonal beers, and one or two “single batch series” beers, which are dreamed up by individual brewers and put on tap. St. Hilaire says they’re in the process of rebranding, and with this comes an entirely new line of seasonal beers. Sebago’s specials are also one-of-a-kind. In addition to happy hour from 4 to 7 p.m. every weeknight, there are substantial discounts and specials on late-night food and drink. Check its website for more details. Its $5 appetizers after 10 p.m. have been a crowd favorite for years and pull in a lot of people who work late. The Portland brewpub might be trying to change its outward appearance, but by the looks of it, business is booming, despite the location or aesthetics. Six TVs dominate the bar area, T-shirts are for sale right as you walk in, and the dining room has wall-to-wall carpeting – these things probably won’t change anytime soon. But maybe they don’t have to. Sebago brews great beer, offers terrific daily specials and caters to large groups who might not have anywhere else to go. While updates are always good and for the most part well received, Sebago Brewing Company has been around since 1998, so sweeping changes might not be necessary – 16 years and counting speaks for itself. SPECIALS: Happy hour 4 to 7 p.m. Monday to Friday; 10 p.m. to close drink and food specials; weekly specials 4 p.m. to close; Monday burger and pint for $9.99, Twenty2 Vodka cocktails for $5 and 22-ounce Saddleback Ale for $3, $3 tall brews; Thursday $1 off glass of wine. AMENITIES: Six TVs, lots of seating, good for large groups, clean bathrooms, outdoor seating. BOTTOM LINE: This is one of four Sebago Brewing brewpubs. Located on the bottom floor of the Hampton Inn, the Portland Sebago location is often mistaken for the hotel’s restaurant. While many of the hotel’s guests, as well as tourists in the summer, frequent the pub, much of its clientele are business professionals, sports enthusiasts or larger groups who meet at this restaurant weekly. Expect a lively crowd most nights, especially when a game is playing. The beer is great, the food is good and the service is acceptable. Sebago is a reliable bar across the board.